Cold hands, warm heart? That's all well and good but now the temperature has dropped we just want warm mitts and feet! Reflexology is brilliant for the circulation and at the end of a treatment, my clients' feet and toes are warm and even in colour. Our feet and hands get cold in the winter because as warm-blooded beings, us humans self regulate our body temperature. When we’re exposed to colder temperatures, our body constricts its small blood vessels (found on our extremities), to keep our vital organs warm, so our feet and hands get cold as a result. If you're one of the brave folk in Cornwall who wear shorts and flip flops all year round (my son included) I salute you! However, as someone who often feels the cold and suffers with Raynaud's, I'm all for the cosy. Here are some easy tips for keeping your hands and feet warm this winter. Wear warm clothing! Although many of us blame our chilly hands and feet on poor circulation it's actually much more to do with not wearing enough warm clothing. If we wear the right amount of layers and clothing for where we are and what we're doing, we won't lose body heat and our fingers and toes will stay nice and warm. It's really that simple! Always over-estimate what you'll need and then you can remove layers if it's too much. Wear warm gloves, use mini heat packs in your pockets, pop on a hat. Bed socks may not heat things up in the romance department but if you need to, wear them! Keep your home (or most-used rooms) warm. If you share your home this often means it's battle of the thermostat time! Heating is expensive but it's important to be comfortable – I've found that using an oil-filled radiator in the room I'm in can really do the trick. As an aside, did you know that women do biologically tend to feel the cold more than men? Women tend to have less muscle tissue, which generates heat, and oestrogen thickens the blood slightly, which reduces blood flow to the tiny capillaries supplying the extremities. Eat heart-healthy foods. Foods like oily fish, nuts, olive oil, oats, fruit and veggies boost your circulation which is essential for adequate blood flow and temperature regulation. That good old Mediterranean diet comes up trumps again! Spice up your life! Certain spices have been shown to warm up the body, including cardamom, cinnamon, turmeric, cayenne pepper and ginger. These spices have a range of additional health-boosting properties (including reducing inflammation and supporting the digestive system) so why not add them to your meals where you can? 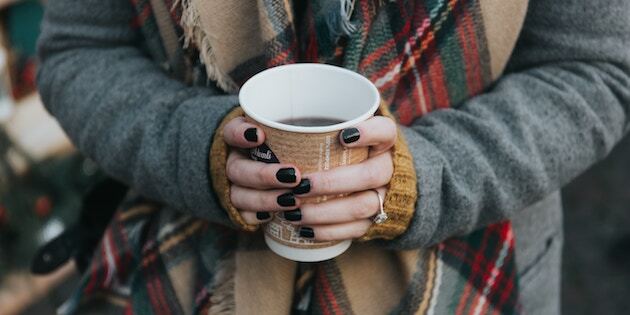 Sip on warm drinks. Not only will this keep your body a more even temperature, holding a warm cuppa obviously keeps your hands warm too. Avoid overdoing it on caffeine by also drinking herbal tea, hot water (adding ginger or lemon is nice) and warm milk (popping in some cardamom, cinnamon or turmeric tastes great). Keep moving. Movement keeps our blood flowing which in turn boosts our body temperature. The gym, running, yoga, etc. are great but incorporating regular, basic movement into each day is important too. Have a break from what you're doing, stretch your upper and lower body, pop on those layers, and go for a quick walk around the block. Hand and foot exercises. Instinctively we rub our hands and feet when they're cold but specific exercises can keep them warm and improve our dexterity. Rub your hands together, massage your feet, open and close your fists, circle your wrists, and circle and flex your feet. These are easy exercises to do even when you're desk-bound, or if you have a limited range of movement. I hope these tips have helped, and I hope you keep warm and well this winter!